I wanted to update this July 27 post on the value of vacant lots in San Francisco because I have some convenient photographic evidence of how construction crews do their work in such close confines. 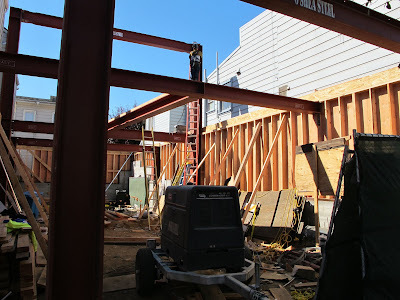 It wasn't hard to find; there are two projects blocking the sidewalks of Cortland Avenue, just a couple blocks from my house, in the Bernal Heights neighborhood. One happens to be right next to a legendary local bar called Wild Side West. The house next to the bar is basically just a floating shell now. 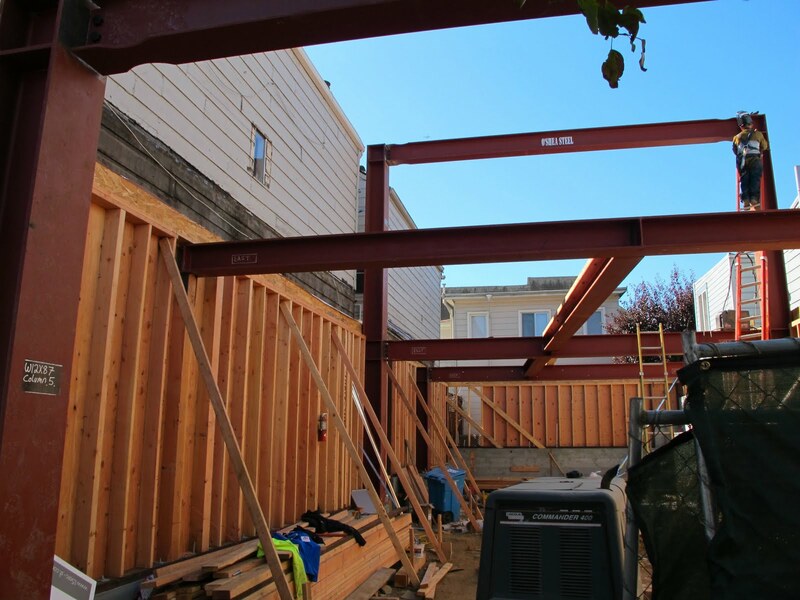 It's cheaper to keep some portion of the exterior intact because then it's considered a remodel rather than a new structure when it comes to permits. A block down the street an entirely new house is going up in the narrow space between two buildings. The girders are going up today. Not exactly a tranquil time for the neighbors as the new house takes shape. Despite almost 15 years in San Francisco, the real estate market here continues to confound me. 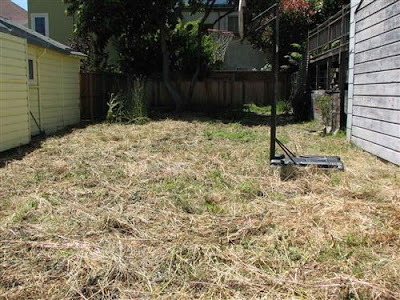 While Flint struggles to mow its ever growing supply of vacant lots, San Francisco continues to sell its increasingly rare empty spaces. For insane prices. The 25 X 70 vacant lot pictured above at 842 Moultrie in Bernal Heights is yours for just $399,000. I'm assuming the basketball hoop is not included. Is that legally unencumbered and buildable as to setback requirements, abutters' view and light rights due to constructive use, etc.? That window on the left and balcony on the right would be considerably less functional if they faced near-zero-setback walls. JWilly, I can only address this in generalities. Basically, you can build a house in keeping with the other houses in the neighborhood. But the planning commission overrules this all the time...allowing three story houses to overshadow two story houses, etc. I'm pretty sure you have to have a planning commission hearing and give notice to neighbors so they can attend, review the plans if they wish, and file complaints against a new build or major renovation. Sometimes people have to build frameworks so neighbors can get an idea of what it would look like, especially if views are blocked. A smart builder would work with the neighbors to mitigate any problems. Maybe a light well would have to be built to accommodate the window on the left. I think decks/balconies like the one on the right don't count for much as they aren't considered livable space. And if the house with a back deck is a two story house, it would be tough for them to block a new, similar two story that observed setbacks and blocked the side view of their deck. 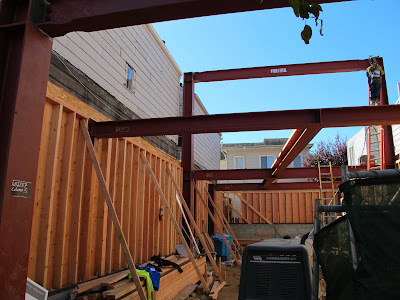 So goes for the views of people behind the lot...if the house is in keeping with the rest of the street, it's tough to block construction, although people try all the time. Check out the artist's rendering of a house planned for this lot via the link above. It's a three story, looming over the little yellow house with the window next to it, which looks a lot like my little green house about four blocks away, which is 700 sq. ft. The neighbors, in this instance, should have the hammer to stop this type of variance. I can't believe it's even a consideration. Maybe a garage or storage shed, but not a dwelling. The price of the "lot" must be figured in inches not feet. What a joke this is. The planning commission and zoning folks must have an interesting meeting each time they meet....if just for laughs. 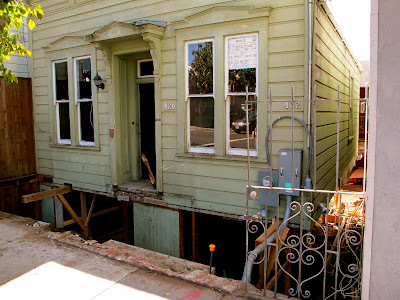 What about basements, when zero side setback is permitted and given S.F. 's stability issues and hilly terrain? 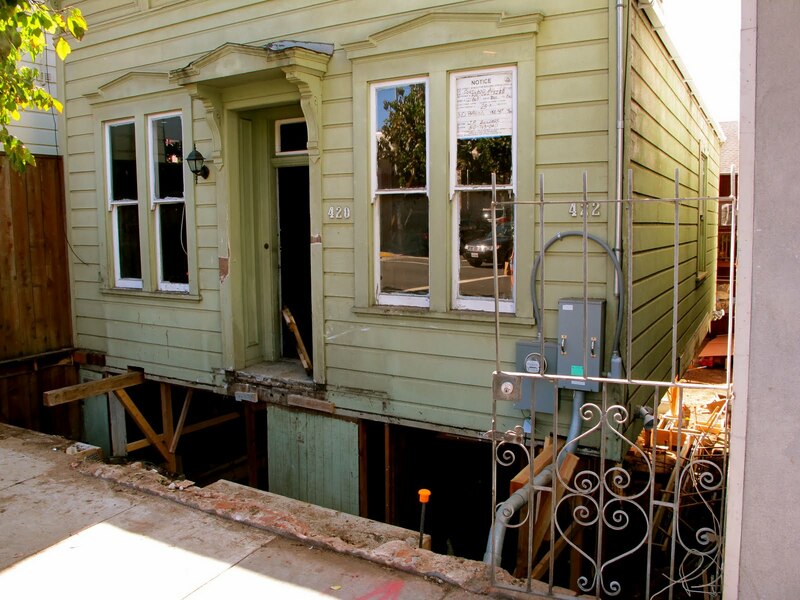 Or do houses in S.F. never have basements? 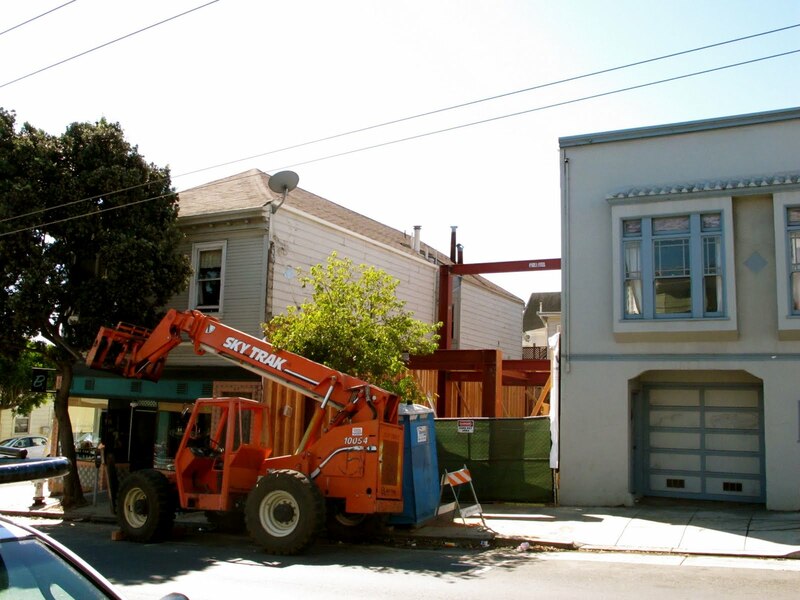 I'd guess that general and foundation contractors in S.F. must pay for a lot of lawyer hours. And whom ever else is on the take in addition to the lawyers.. I've seen a few of the row house subs there and the basements are almost all living area or subterranean garages you drive down into. The architectural design takes advantage of all space including the roof area for sunning. The real property rates for those units were selling for six hundred thousand and up. The one my daughter lived in recently sold for eight hundred thou. They were probably constructed in the mid to late sixties. The value of these places would be more like thirty five to forty thousand in Minneapolis, St. Louis or Cleveland. Before the crunch of course. My garden is twenty eight X seventy, but then again, I can't grow oranges and avocados. As I recall, Michael Moore spent some time in San Francisco when he worked for Mother Jones or some similar magazine. 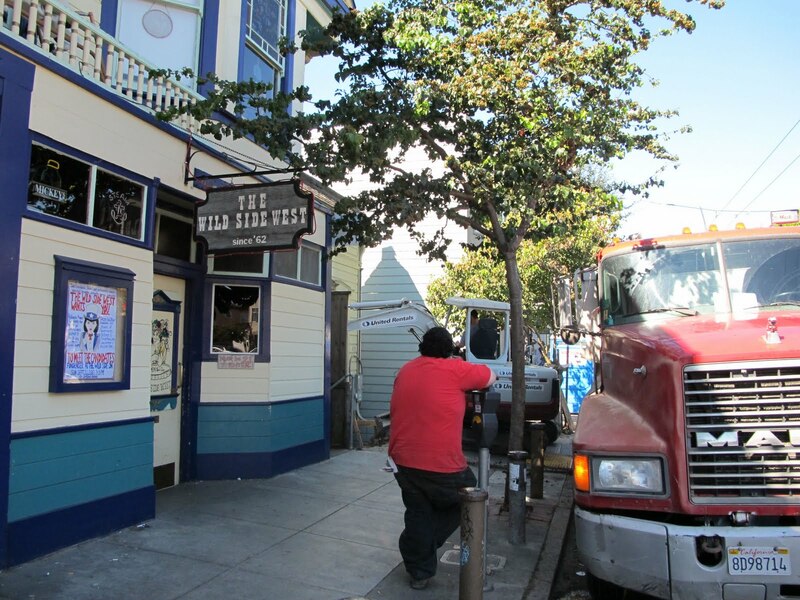 I can't recall where it was, but he was perplexed at how the economy of San Francisco worked compared to Flint, and how every esoteric restaurant and boutique managed to survive when hard industry had already begun to flounder in Flint. In that regard, I had to agree. What is it that supports this kind of real estate prices? Can it continue indefinitely if the rest of the country flounders? The lower the density the lower the economic value, the lower the diversity, the lower the vibrancy, the lower the walkability, etc. Now, this, as you all note in just the issues surrounding the single lot, is ENORMOUSLY complex (San Francisco didn't rely so exclusively on a single industry, has a far more attractive location, better climate, etc.) and is very generalized, but the easiest answer you're going to get. And yes, it will continue (ebbing and flowing) like cities have for millenia! 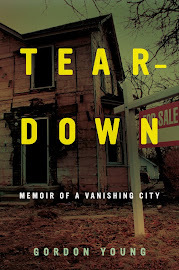 It's important to note that all cities face rough economic periods, boom and busts, etc. and San Francisco is no exception. And the site itself is fantastic for development. No, it doesn't meet the large-lot suburban standards we're used to, but to say it's not fit for a residence is terribly narrow-minded. Silver City sums it up well. A lot of demand with very, very little supply. Foreign investors also seem to love San Francisco, as well as the ultra rich from around the world who just want a condo for weekend jaunts or whatever it is the ultra rich do. That drives the real estate values even higher. And it's not uncommon to hear people talk about how they just fell in love with the city, and they're willing to make big sacrifices to stay here. And when you pay $2,200/month for a nice one bedroom apartment, it's not that big of a leap to take on a $2,500/month mortgage. Plus, it's pretty common here for people to devote half their income to housing. As to what all these people are doing for money, I'm not really sure. Many great cities are less dense. Density is only a factor if there is great interest in a city. Supply and demand is a more accurate description. Are you suggesting a blog called "Las Vegas Expatriates" might be more lucrative? And Uncle Buck, that vacant lot works out to about $1.59/sq. inch. I concede.... The grid of lots in Bernal Heights says it all. I compared it to some in Brooklyn, N.Y. and real property costs and lot size is quite similar, but I can't agree that one would call it a "fantastic" building site. Being tagged with, "terribly narrow minded" goes pretty much against what I'm usually referred to. Broad minded eternal optimist is more like it, or so I have been told. Supply and demand puts it in a nut shell, or better yet, the dimensions of a standard tennis court. Eh? Just kidding....don't get excited. The square inch factor is applicable to Tokyo, Japan...now we are talking about density.